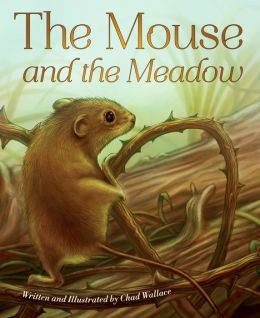 Delightful rhyming verse accompanies gorgeous illustrations in this tale of a meadow mouse and his natural friends and enemies. A young mouse explores the meadow for the first time and finds a fascinating world. A spider spins a marvelous web. A honeybee gathers pollen. A caterpillar weaves a cocoon. The sudden appearance of a box turtle’s head startles the little rodent. But it’s the appearance of a snake that really has him frightened. Barely escaping, the mouse is aided first by a weasel then by a mother rabbit. As night falls, the mouse studies a firefly. He discovers new terror in the swooping of a great horned owl. He is saved by another mouse, who shows him where to hide. As a read aloud, the lilting rhythm will hold children as young as four. For independent reading, second grade readers should be able to tackle the pages. The animal communication rings true. The illustrations are realistic and action-packed. The last three pages of the book highlight many facts about the meadow animals, talk about other animal volumes available from the publisher, and give readers an idea of where to get more information. The publisher’s website, www.dawnpub.com, is rich in resources, including teacher guides. The pages also give a sample of reading activities, like hatching a cocoon and growing a miniature meadow.